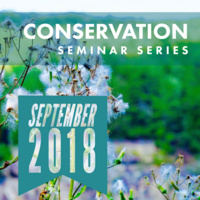 The Conservation Seminar series/course exposes students to multiple aspects of the field of conservation through inspiring speakers from different disciplines. This year, speakers include academics from the University of Georgia (Odum School of Ecology, School of Public and International Affairs, College of Environment & Design, College of Agriculture & Environmental Sciences, Department of Geography) and practitioners employed by state and federal agencies [Georgia Department of Natural Resources, Georgia Environmental Protection Division, USDA National Forest Service (including the International Institute of Tropical Forestry), US Fish & Wildlife Service], and non-governmental organizations (i.e. the Athens Land Trust). Each speaker provides conservation paper(s) that are related to his/her seminar and these readings are made available to all course participants on ELC (E-learning-commons) five days in advance of the seminar. Students are expected to read this material before class. The one-hour seminar is followed by a 30 minute question and answer/discussion period based on the seminar and related readings. Grades are based on class attendance and participation.